Yesterday, the FDA proposed long-awaited action against use of antibiotics for non-therapeutic purposes in animal agriculture. From the outside, this might look more like inaction. The agency is asking drug companies to voluntarily cut back on producing antibiotics for non-therapeutic purposes and to require veterinary oversight of use of these drugs. The announcement comes in the form of three documents in the Federal Register. Final Guidance for Industry: The Judicious Use of Medically Important Antimicrobial Drugs in Food-Producing Animals. Draft Guidance for Industry aimed at assisting drug companies in voluntarily removing from FDA-approved product labels uses of antibiotics for production rather than therapy, and voluntarily changing the marketing status to include veterinary oversight. This is open for public comment. A draft of a proposed Veterinary Feed Directive regulation, also open for public comment, outlining how veterinarians can authorize the use of antibiotics in animal feed. 4. What is “judicious use” and what are FDA’s recommendations? Based on a thorough review of the available scientific information, FDA recommends that use of medically important antimicrobial drugs in food-producing animals be limited to situations where the use of these drugs is necessary for ensuring animal health, and their use includes veterinary oversight or consultation. FDA believes that using medically important antimicrobial drugs to increase production in food-producing animals is not a judicious use (my emphasis). 5. Why did FDA decide to do this now? FDA has worked with many stakeholder groups and the U.S. Department of Agriculture (USDA) to develop a strategy that will be successful in reducing antimicrobial resistance while minimizing adverse impacts on animal health and disruption to the animal agricultural industry. In June 2010, FDA released a draft guidance document explaining its recommendations for change and in the interim period sought and received input from various stakeholders, including the animal pharmaceutical industry, animal feed industry, veterinary and animal producer communities, consumer advocacy groups and USDA. Translation: this has been in the works for a long time and is the result of extensive discussions with the relevant industries. As Food Safety News explains, the reaction of just about everyone to this announcement has been tepid. 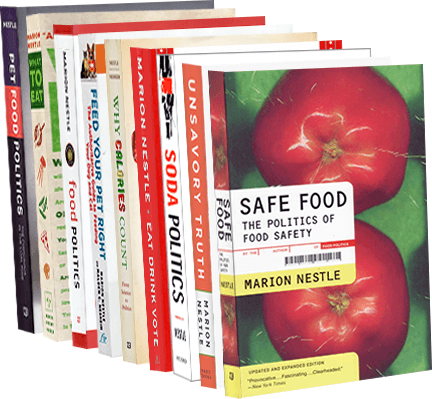 Food safety advocates object to voluntary, because it never works. The meat industry insists that non-therapeutic antibiotics are essential for producing cheap meat under crowded conditions. Harm to small farmers: The guidance could eliminate antibiotics uses that are extremely important to the health of animals…And the requirement for VFDs [veterinary oversight] could be problematic, particularly for smaller producers or producers in remote areas who may not have regular access to veterinary services. Voluntary equals regulation: The guidance, which does not have the force of law but may be treated as such by FDA, is a move to address an increase in antibiotic-resistant illnesses in humans, which opponents of modern animal agriculture blame on the use of antibiotics in livestock and poultry production. The science is “junk”: But numerous peer-reviewed risk assessments, including at least one by FDA, show a “negligible” risk to human health of antibiotics use in food-animal production. The FDA’s position on non-therapeutic use of antibiotics in animal agriculture is quite clear. The agency recognizes that based on the science, the use of antibiotics as growth promoters in animals poses a serious risk to human health. I’m guessing this is the best the FDA can do in an election year. This move looks to me like a direct challenge to drug companies and meat producers to clean up their acts and take some responsibility for the effects of their misuse of animal antibiotics on public health. It’s also a challenge to food safety advocates to make sure that the FDA monitors the effects of its voluntary guidance and, if the industries don’t cooperate, that the FDA gets busy on real regulations. “You and I and our children would be long dead before F.D.A. could restrict all of these uses on its own,” Ms. Rogers [of the Pew Foundation]said.